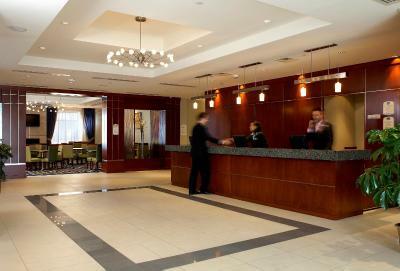 Lock in a great price for Fairfield Inn & Suites by Marriott Montreal Airport – rated 8.7 by recent guests! Staff was very nice and accommodating. We were just in for a short time for a layover from a flight. Drivers for the shuttle back and forth to the airport were helpful with all our luggage. Frequency was very convenient even at our odd hours. I like that it’s walking distance to the train station. A very nice place to stay. The beds are very comfortable. The room and toiletries provided. The make-up wipe was a nice addition to what is usually found in similar hotels. Coffee and tea available to go. We loved having enough space for two adults and two teenage girls to spread out. the bed was super comfortable and the ride to the airport only took minutes. the staff was particularly accommodating as we had to stay there the day we arrived in Montreal before driving to Quebec City because of freezing rain. Carpets were new and beds were comfy. Location was great. Breakfast was pretty good. The front desk was very accommodating when I arrived after a long flight. Easy shuttle service with very nice driver who helped with our many luggage. Competent and kind front desk staff. Small pool but enough for the kids to unwind after/before trip. Clean facilities throughout. Good value for money when wanting an airport hotel for an early flight. Easy check-in process. 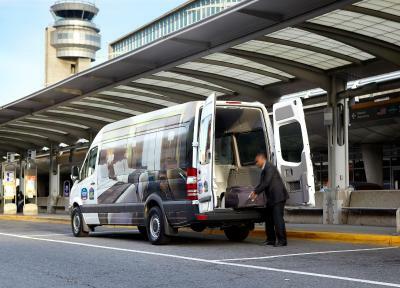 Free airport shuttle every 30 minutes, 24/7 (very close to airport...5 minute drive). Room was above-average for mid-range hotel chain. Comfortable bed. Restaurant and bar on-site open until 11 pm and one of the best free hotel breakfasts I have ever had. Very clean property and friendly staff when I checked in and out. Fairfield Inn & Suites by Marriott Montreal Airport This rating is a reflection of how the property compares to the industry standard when it comes to price, facilities and services available. It's based on a self-evaluation by the property. Use this rating to help choose your stay! Featuring free shuttle service to and from Montreal-Pierre Elliott Trudeau International Airport, this Dorval hotel is less than 12 miles from downtown Montreal. Free Wi-Fi and a continental breakfast are provided. A flat-screen TV and tea- and coffee-making facilities are found in each modern room at Fairfield Inn & Suites by Marriott Montreal Airport. Some rooms also include a microwave and a small refrigerator. The Napa Lounge has a full service bar and 3-course dinners made from in-house items. 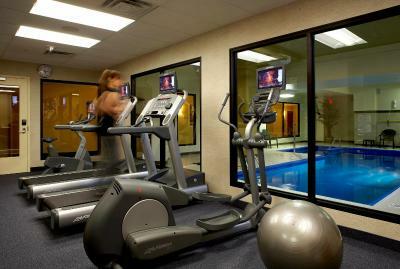 Guests can also relax and catch up on sports or news on the lounge’s TV. 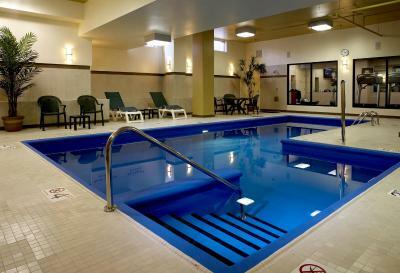 Guests at the Marriott Fairfield Inn & Suites Montreal Airport can enjoy the indoor swimming pool, fitness center and game room. A business center and a laundromat are also available. The Dorval Train Station is less than a 5-minute walk from the hotel. Parc du Mont-Royal is a 25-minute drive away. This property also has one of the top-rated locations in Dorval! Guests are happier about it compared to other properties in the area. This property is also rated for the best value in Dorval! Guests are getting more for their money when compared to other properties in this city. When would you like to stay at Fairfield Inn & Suites by Marriott Montreal Airport? This studio features a sofa bed, a microwave and a small refrigerator. It also includes a flat-screen TV and tea/coffee-making facilities. Private parking is available on site (reservation is needed) and costs CAD 18 per day. Room has a flat-screen TV, tea and coffee-making facilities and mini fridge. With an excellent airport location and comfortable accommodations, the Fairfield Inn & Suites Montreal Airport offers guests a superb hotel experience. 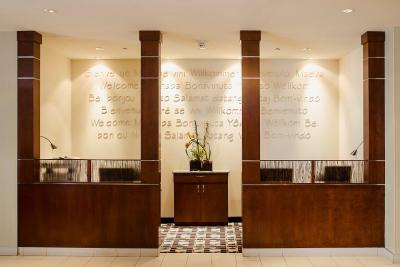 House Rules Fairfield Inn & Suites by Marriott Montreal Airport takes special requests – add in the next step! Any additional children or adults are charged CAD 20 per night for extra beds. Fairfield Inn &amp; Suites by Marriott Montreal Airport accepts these cards and reserves the right to temporarily hold an amount prior to arrival. Fairfield Inn & Suites by Marriott Montreal Airport accepts these cards and reserves the right to temporarily hold an amount prior to arrival. You must show a valid photo ID and a credit card upon check-in. Special requests cannot be guaranteed and are subject to availability upon check-in. Additional c harges may apply. Please note, guests who would like to extend their parking beyond the length of their stay must contact the hotel directly for approval. Additional charges will apply. The internet did not work. It cut out continually and was a major frustration. The front desk was short and unwilling to offer suggestions for long term parking. The television had three channels that would come in. Again another frustration. The day I was there, they had problems with the shuttle vans. Took a bit longer that I was expecting to solve the issues. The smoked meat sandwich was not very good and definitely not worth the price! I did not find the beds terrible comfortable! Breakfast hours are too limited for a 24h hotel. Room ventilation is noisy.